Air Supply空气补给中文网 | 华人全球唯一空气补给乐队中文论坛»乐迷交流 › Air Supply空气补给 › “空气补给”日报 › 40 Years - The Retrospective › 第2-2章：耶！耶！耶！ - Yeah! Yeah! Yeah! 第2-2章：耶！耶！耶！ - Yeah! Yeah! Yeah! 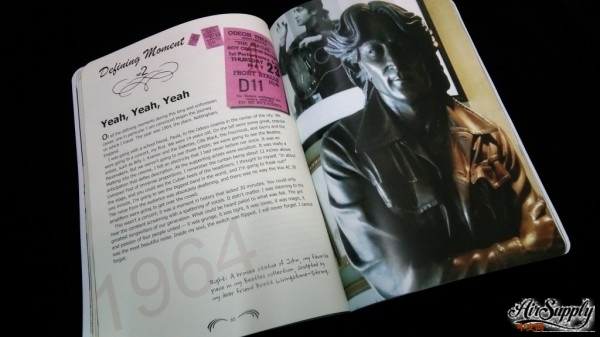 Right: A bronze statue of John, my favorite piece in my Beatles collection, sculpted by my dear friend Brett Livingstone-Strong. Of all the defining moments during this long and unforeseen career, one in particular I am convinced began the journey on which I travel. The year was 1964, the place, Nottingham, England. I was going with a school friend, Paula, to the odeon cinema in the center of the city. We were going to a concert, my first. We were 14 years old. On the bill were some great, popular artists, such as Billy J. Kramer and the Dakotas, Cilla Black, the Fourmost, and Gerry and the Pacemakers. But we weren't going to see those artists; we were going to see the Beatles. Walking into the cinema, I felt an electricity that I had never before nor since. It was an anticipation that defies desciption. All the supporting artists were excellent. It was really a Liverpool Fest of immense proportions. I remember the curtain being about 12 inches above the stage, and you could see the Cuban heels of the headliner. I thought to myself, "In about one minute, I'm going to see the biggest band in the world, and I'm going to freak out!" The noise from the audience was absolutely deafening, and there was no way the Vox AC 30 amplifiers were going to get over the crowd. This wasn't a concert; it was a moment in history that lasted 30 minutes. You could only hear the constant screaming with a pattering of vocals. It didn't matter. I was listening to the greatest songwriters of our generation. What could be heard paled to what was felt. The grit and passion of four people united - it was grunge, it was tight, it was loose, it was magic, it was the most beautiful noise. Inside my soul, the switch was flipped. I will never forget. I cannot forget. Copyright © 2009-2019 Air Supply China Fan Site. All Rights Reserved.